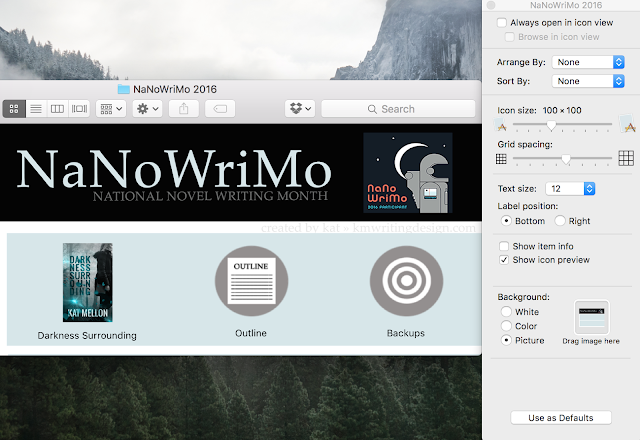 This is an updated version of my 2013 NaNoWriMo USB drive post (which was, awesomely enough, featured in NaNoWriMo's procrastination station. Whoa!). This set-up utilizes custom folder icons and custom folder backgrounds. With the Finder window of your USB drive open, press command + J to open the Visual Organization panel (shown above). Select "Picture" under "Background" and drag your desired image file into the square. You can also adjust the size of your icons with the "Icon Size" sliding bar. Outline: Store a copy of your outline here (if applicable). Accomplishments: Received a nice compliment? Have screenshots of your progress bar after a long day of writing? Back those up here. Rewards/Research: Use this tutorial to create "listings" for any and all rewards you plan to treat yourself to. (Going to buy yourself a NaNo t-shirt after hitting 50K? Create an icon that takes you to the t-shirt's listing in the NaNo store. Want to take a long nature walk at 25K? Simply drag and drop a picture of a nature trail!) Alternately, you can use this folder to catalog your pre-NaNo research. Pre-NaNo Draft: If you're a NaNo rebel and are picking up where you left off on an already in-progress manuscript, keep a copy of your pre-November draft in this folder for reference and safekeeping. Because I wrote the first 50K of this book in five days as part of the "#50K5DAYS" challenge, I created dated back-up folders ahead of time. In an ideal world, you'll back up your novel to at least one location every single day. You can download all of this (background files, icons, etc) in a .zip file (1.9 MB) via Google Drive by clicking here. Note that if your flash drive is formatted for Windows, you will need to go to Utilities>Disk Utility and "Erase" the content of your USB drive in order for these tricks to work. I recommend doing this only if the USB drive is brand new or if you have made copies of the USB drive's existing content. 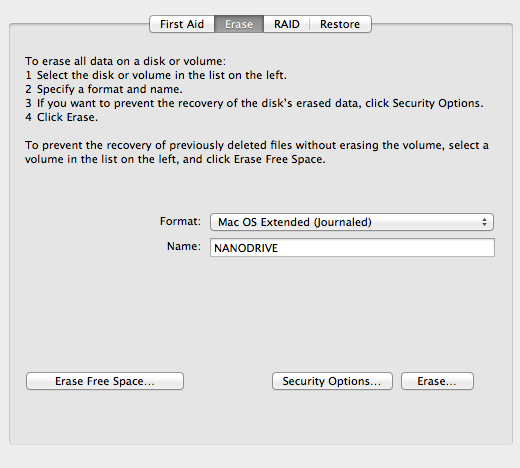 Be sure to select "Mac OS Extended (Journal) from the drop-down list of options. 1. Select the folder you would like to change the appearance of and press command + i. 2. Open your desired folder icon image. 3. Press command + a to select the entire image. 4. Press command + c to copy. 5. Select the folder icon in the information panel. 6. Press command + v. Voila! For more tips (including a snazzy Novel folder and Agent Directory), check out my Visual Organization Series. Have a smashing NaNoWriMo 2016, you guys!